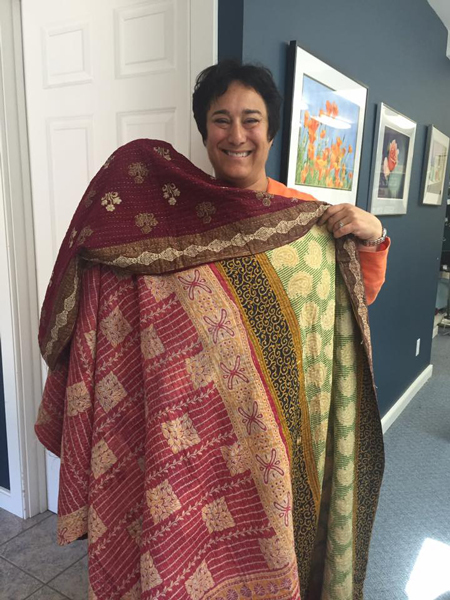 Kantha is very popular with tourists visiting Bengal and is a specialty of Bolpur, West Bengal, India. 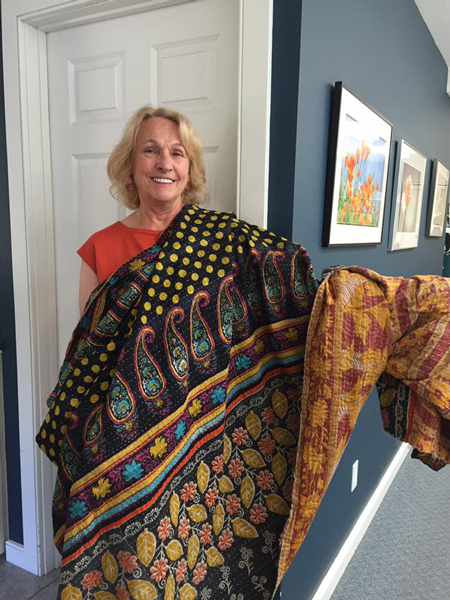 Nakshi kantha, a type of embroidered quilt, is a centuries-old Bengali art tradition in Bangladesh. 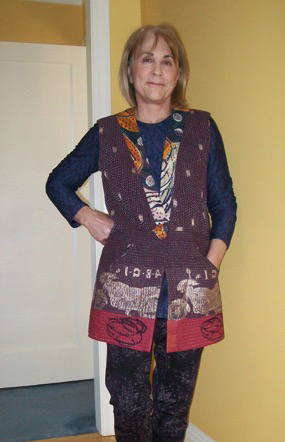 The basic material used is thread and old cloth. 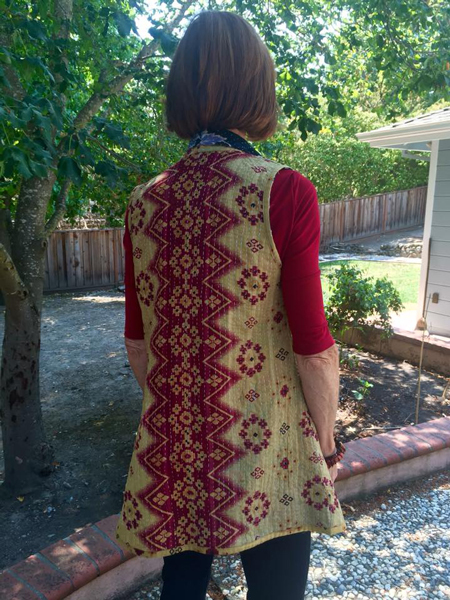 The running stitch called "kantha stitch" is the main stitch used for the purpose. 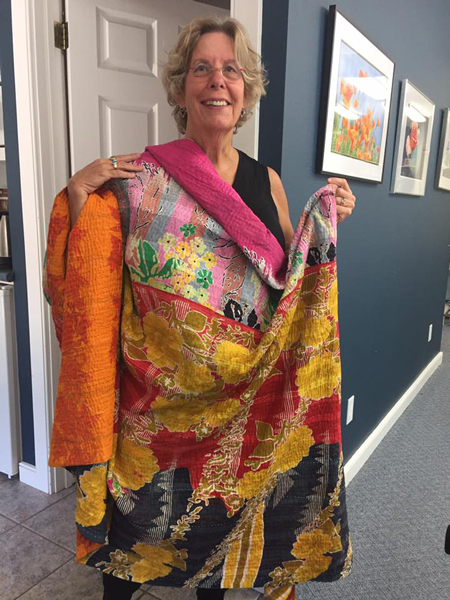 Traditionally, kantha was produced for the use of the family. 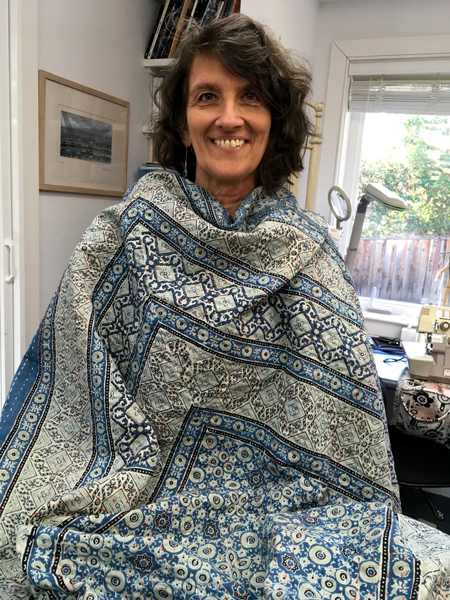 Today, after the revival of the Nakshi kantha, they are produced commercially, and can be purchased from Amazon, Ebay, or Etsy. 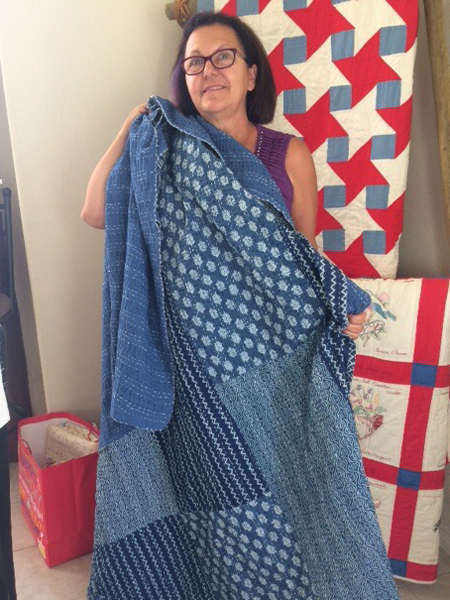 Jane challenged her students to sew something using a Kantha quilt. 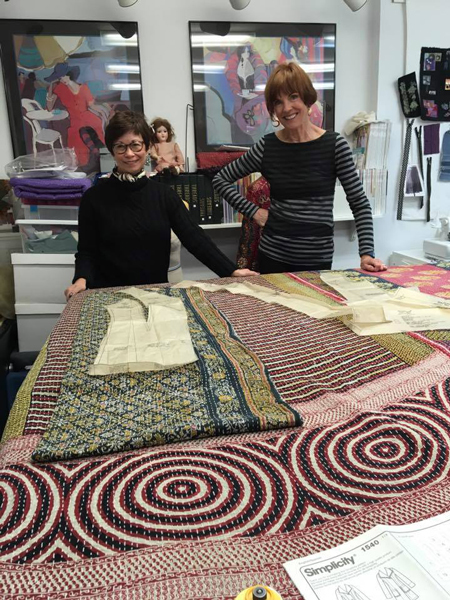 They gathered in Spring 2017 at Jane's studio to show the exciting garments they created. 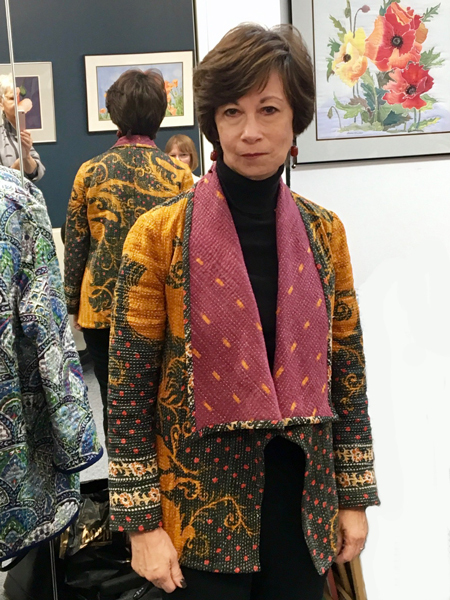 Jane videoed the styleshow. 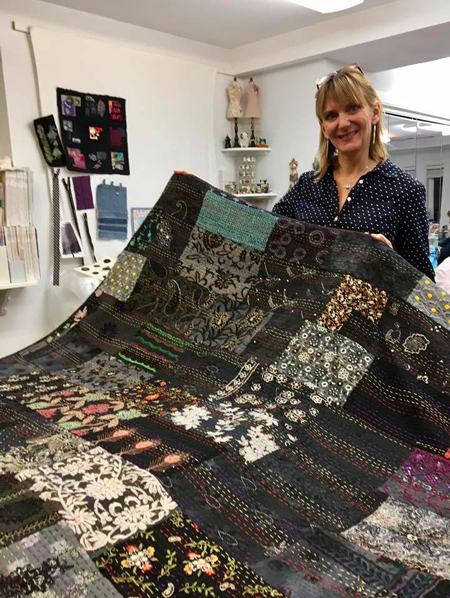 You can view this on Youtube here, or Jane's Facebook Kantha Video here. 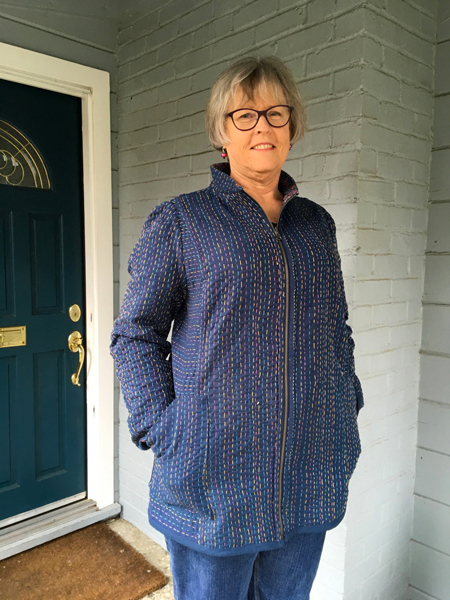 Jeanne O used Simplicity 1540 for this interesting coat, and asked Jane for help in drafting a different collar. 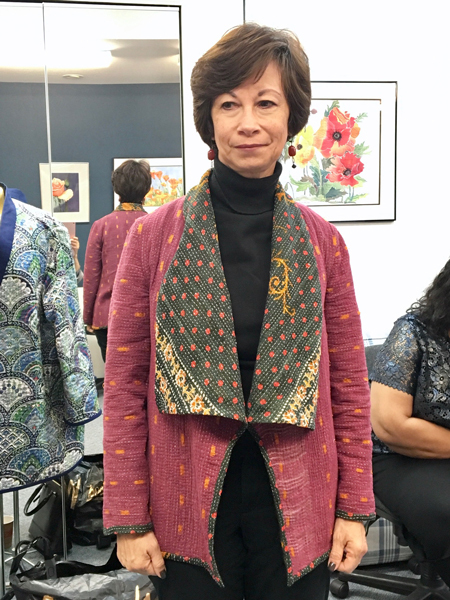 Jeanne O chose StyleArc Estelle Ponte Jacket for this vest. 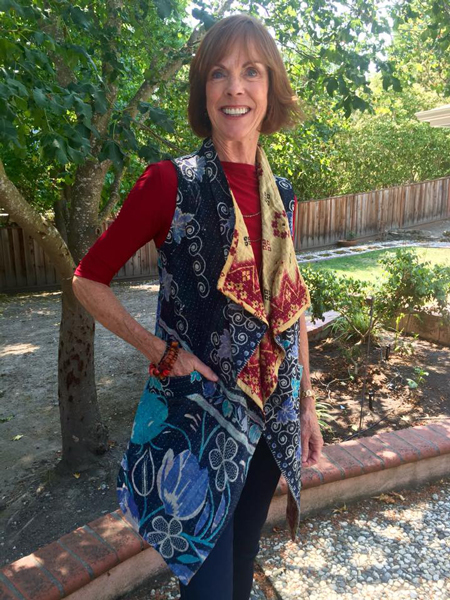 Diana T used the StyleArc Veronica vest pattern. 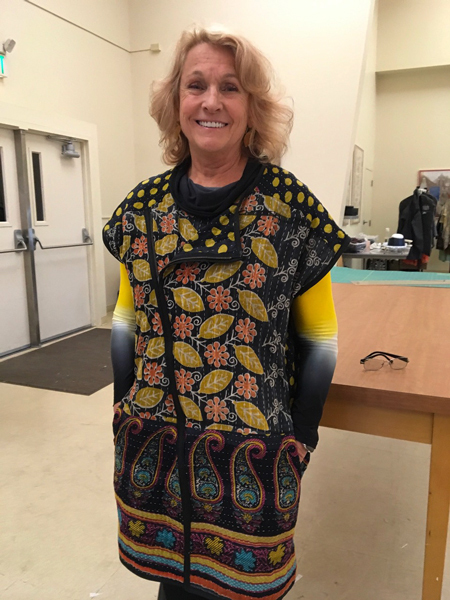 It has a yoke, pockets and a zipper. 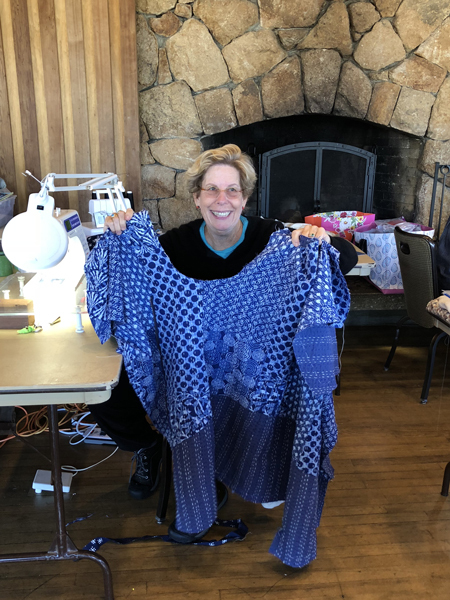 Vicki is making beautiful clothes. 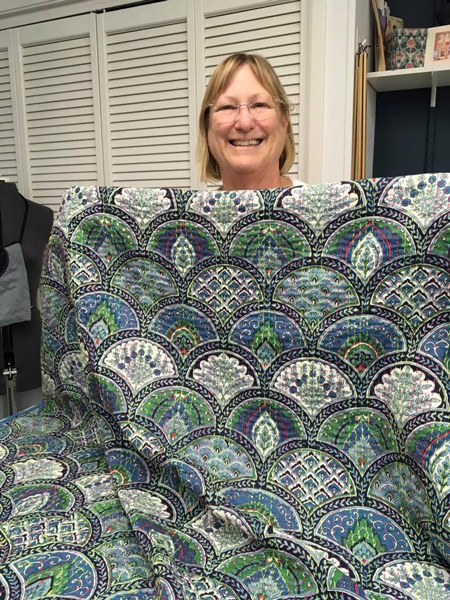 She recently retired and has discovered sewing again. 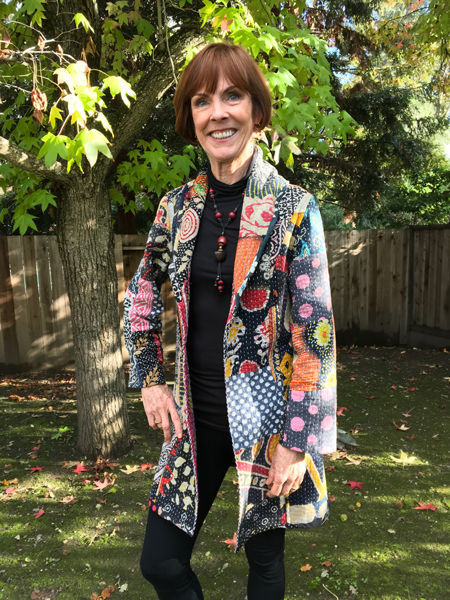 She is petite and is enjoying clothes that fit. 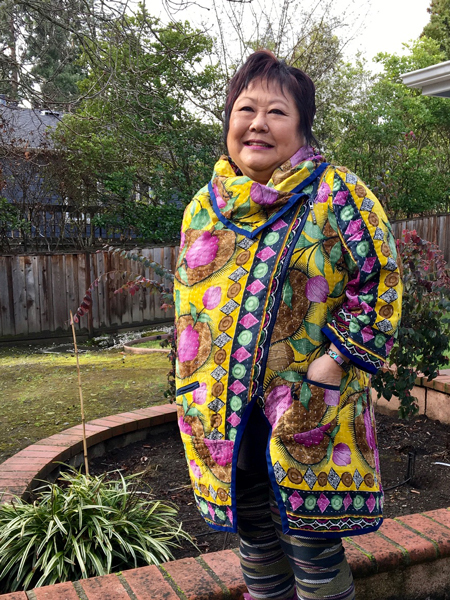 This is the second kantha she used to created a reversible lightweight coat. 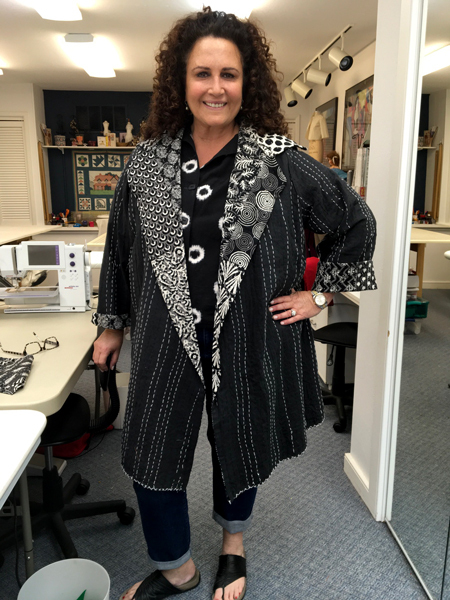 Vicki made welt pocket openings on the print side and patch pockets cover the welts on the solid side. 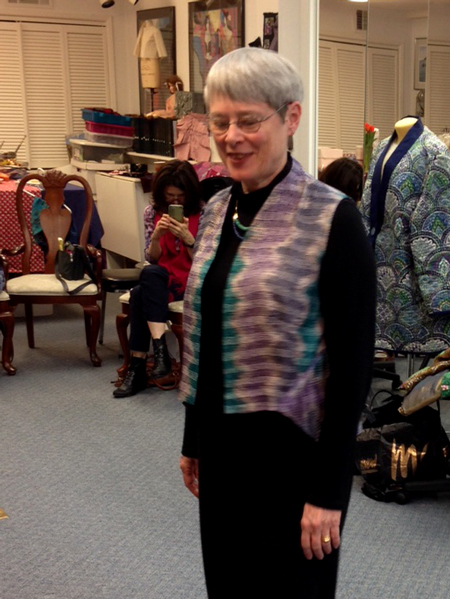 Ann L was inspired by a designer garment when making the pattern for this silk vest. 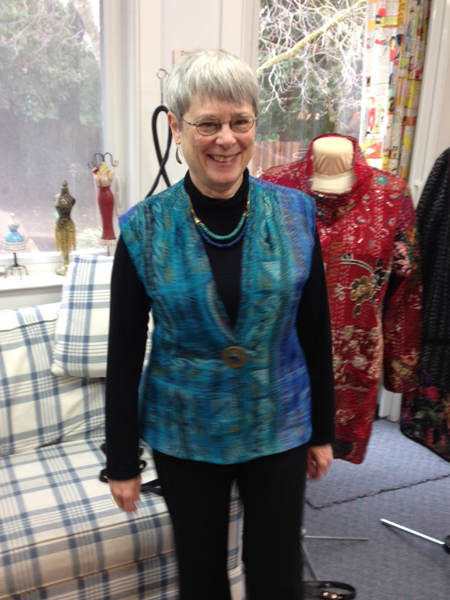 Ann L used Marcy Tilton's Vogue V8982 for her vest. 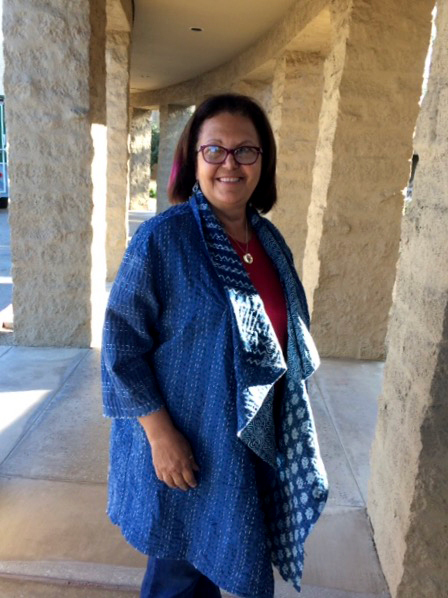 Diana's second Kantha is very unusual. It was bought online from India and has many little Indian mirrors called Sheesha. 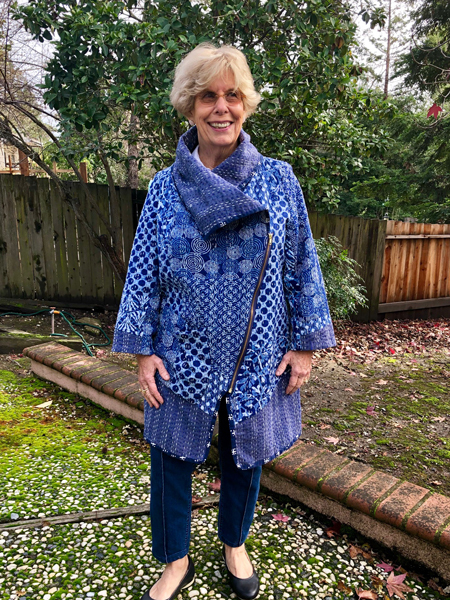 Diana used a Vogue pattern that had an attached scarf but decided to give the coat a simple collar instead. 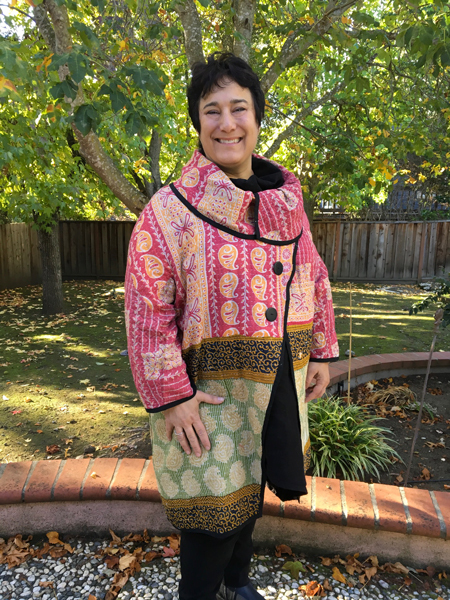 Vicki G used one of her custom patterns for this reversable jacket. 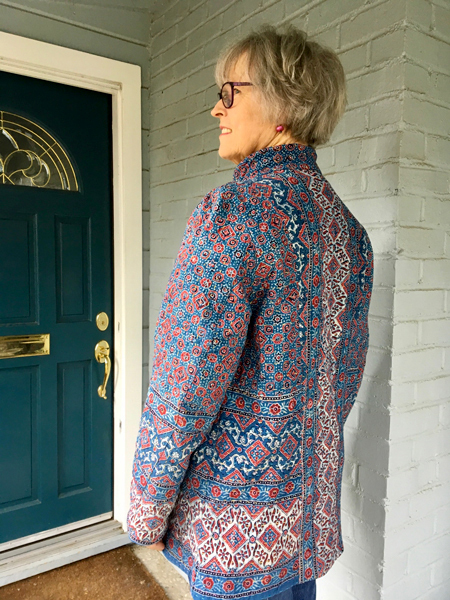 Vicki G spent a lot of time pattern matching the fabric at the seams. 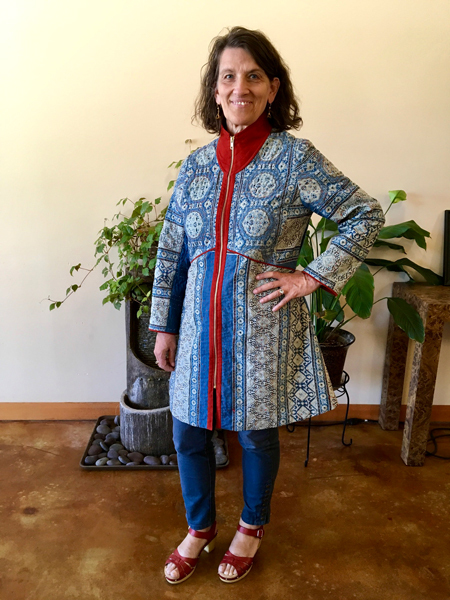 At Janes spring Asilomar Sewing Retreat, Liddy spent time working on her Kantha coat. 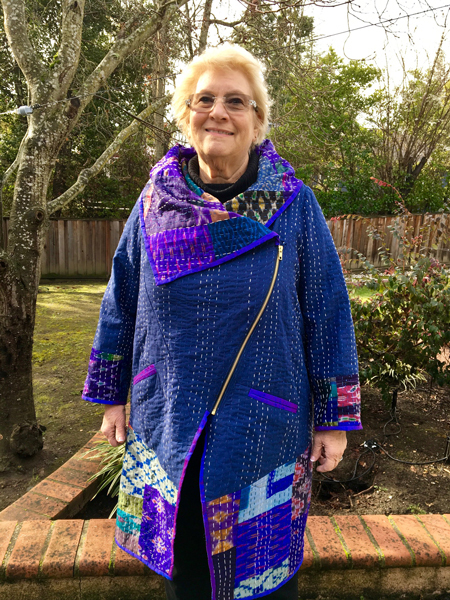 Liddy finished her cute kantha coat using the Genevieve StyeArc pattern. 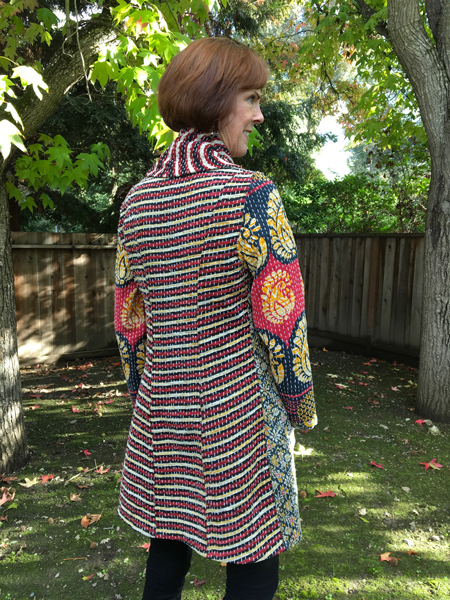 She gets lots of complements on her coat. 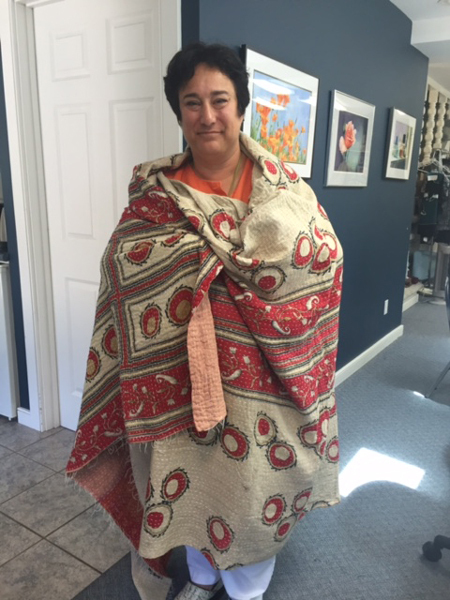 Another student bought the quilt online from India. 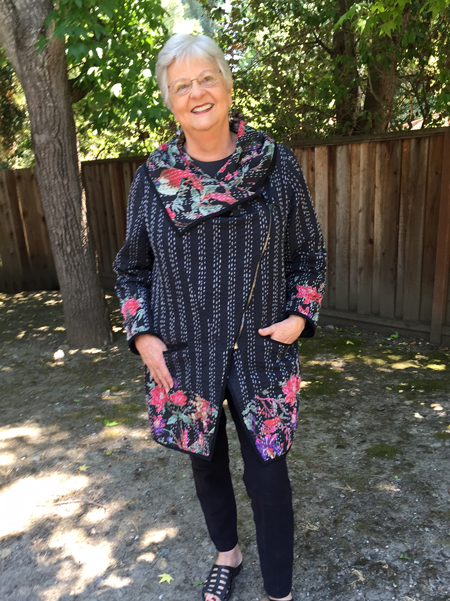 JoAnn loves pink! 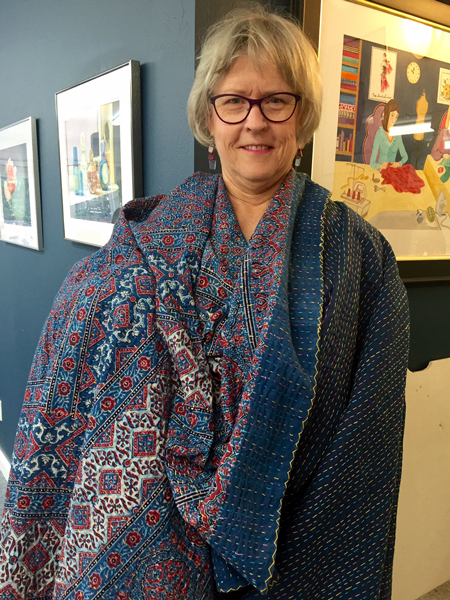 Jane bought this beautiful Kantha quilt online from India. 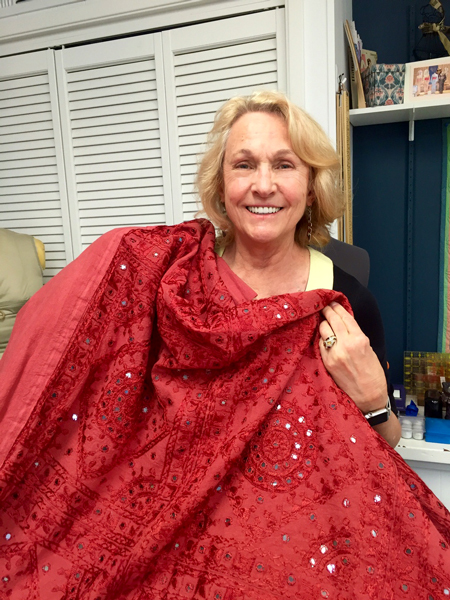 It is made from evening and wedding saris. 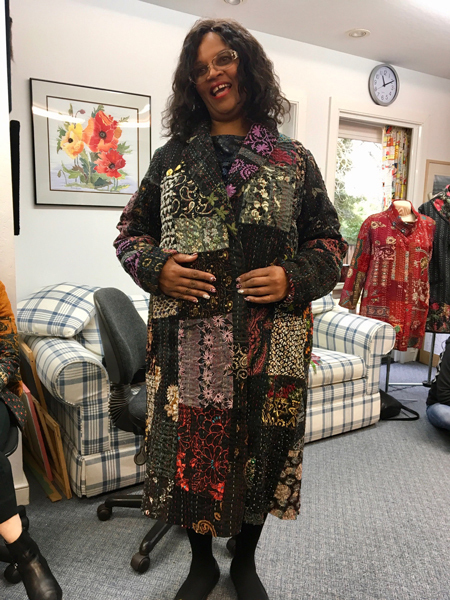 She sold it to JoAnn and she has created this wonderful jacket. 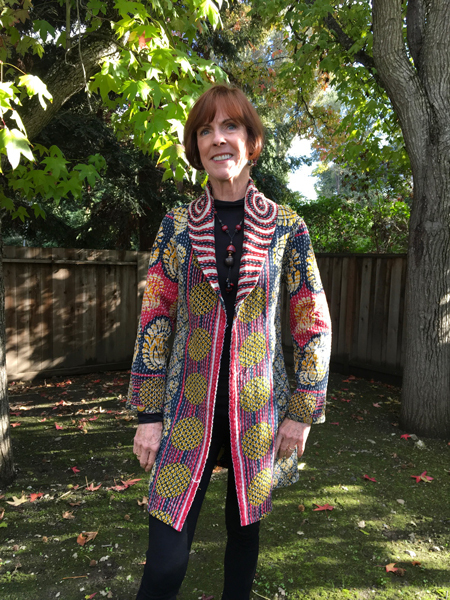 JoAnn copied the pattern from a ready to wear jacket of Sharon's. 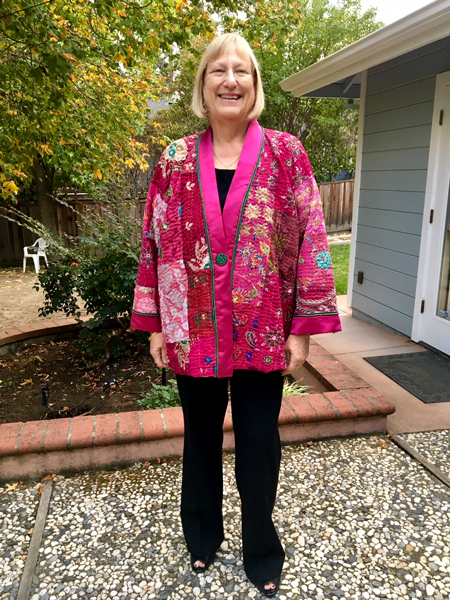 She added a solid pink satin band and cuffs, and double piped them in complementary colors. 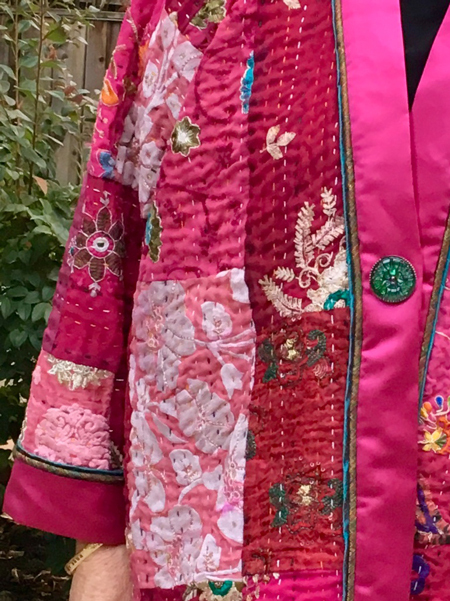 All the seams inside are completed with Hong Kong finish. 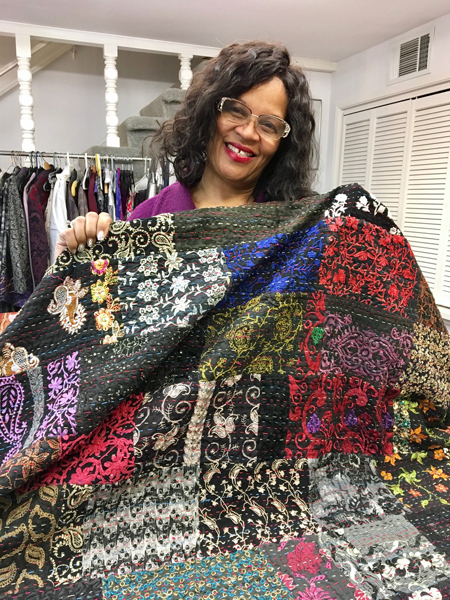 Zoom in on the close up to see the lovely detail. Love it! 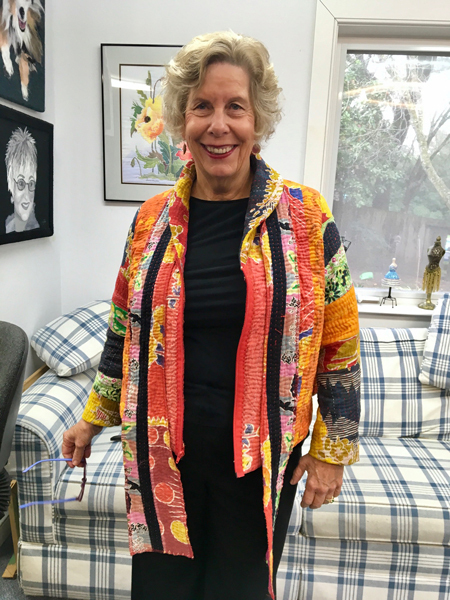 You are looking SO good JoAnn. 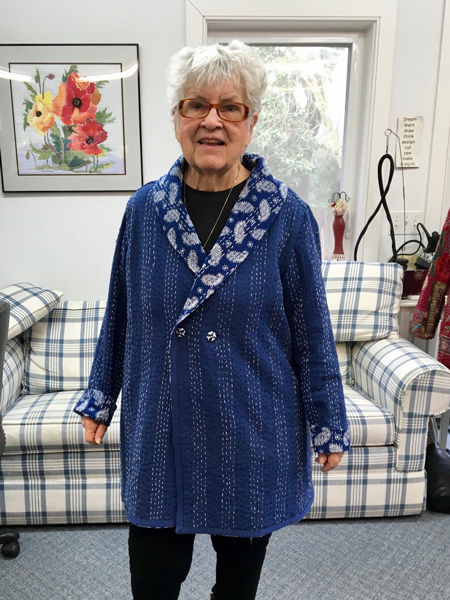 Joy D looks happy with her reversible coat made using Marfy 2257. 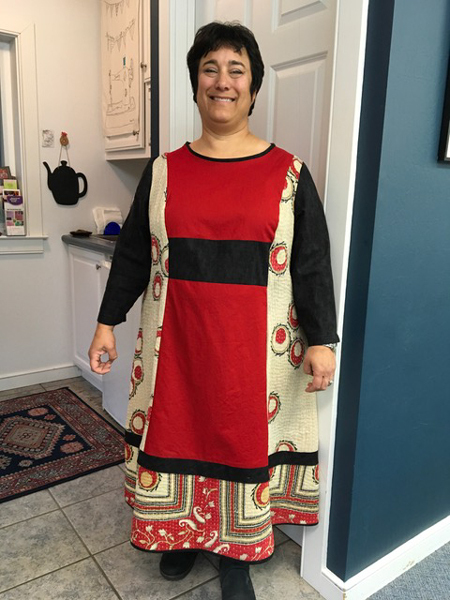 Joy D combined black and red cotton with her Kantha quilt, and used McCalls pattern 9518. 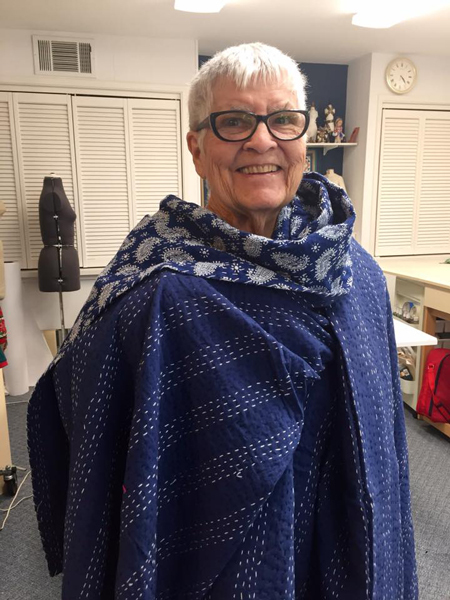 Joy D selected Burda patten 6736 for her Kantha coat. 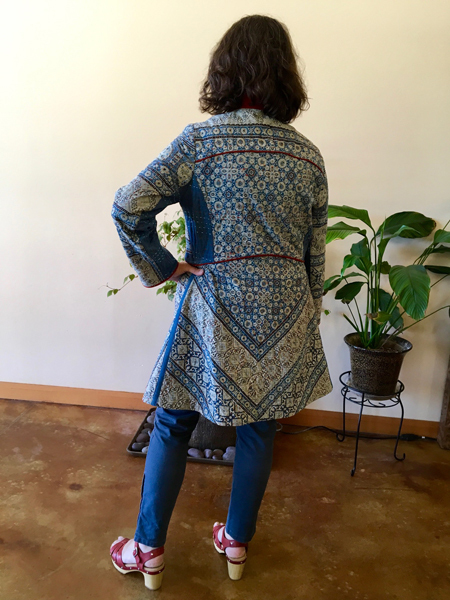 Jeanne O chose Saf T Pockets Journey Jacket Two. 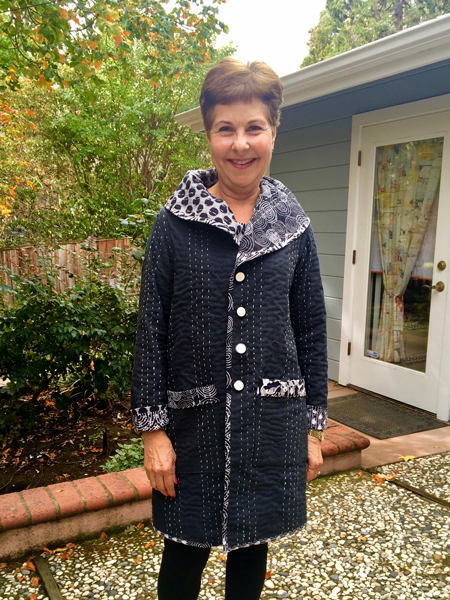 Jeanne O used StyleArc Genevieve Coat pattern. 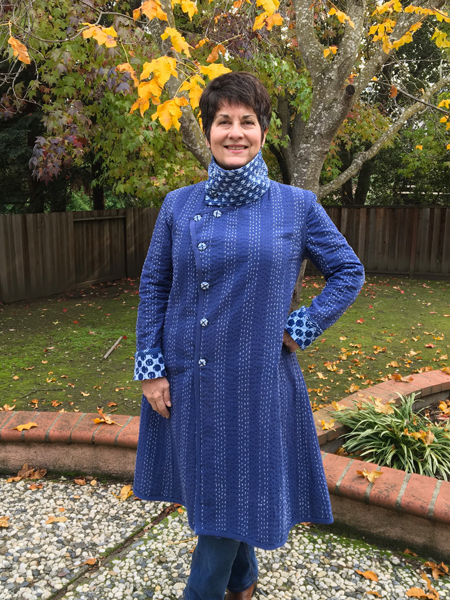 Vicki Z chose Butterick B6292 for her coat. 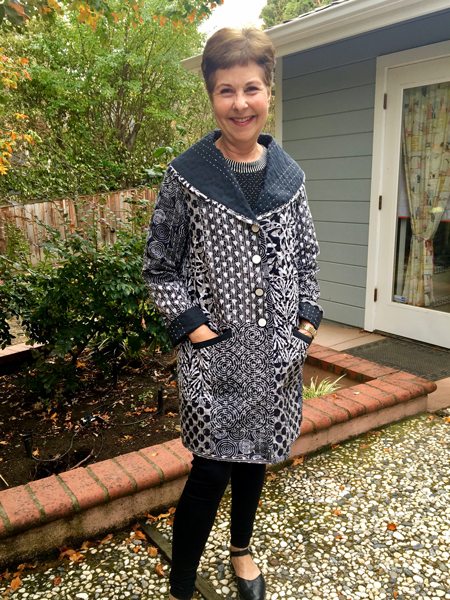 Katherine W made her beautiful coat with Marcy Tilton Vogue V8676 pattern. 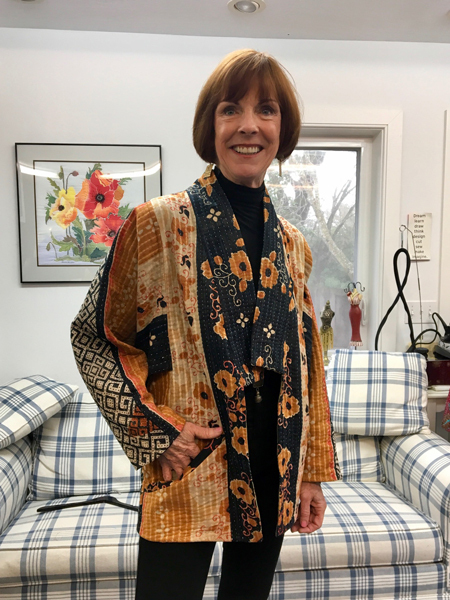 Patty made a jacket and Jeanne made a coat from this shared quilt. 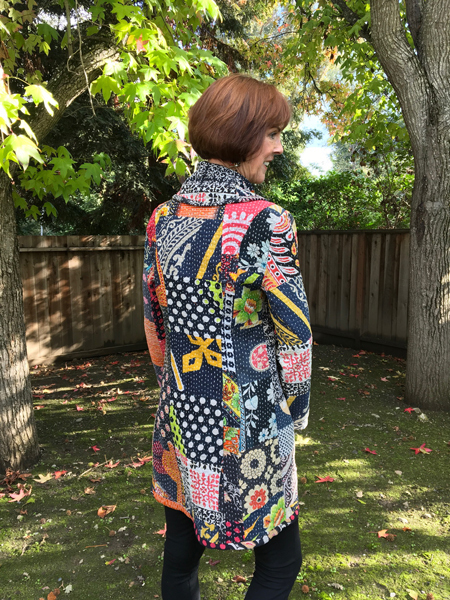 Patty used the Kwik Sew pattern 3379 for her jacket. 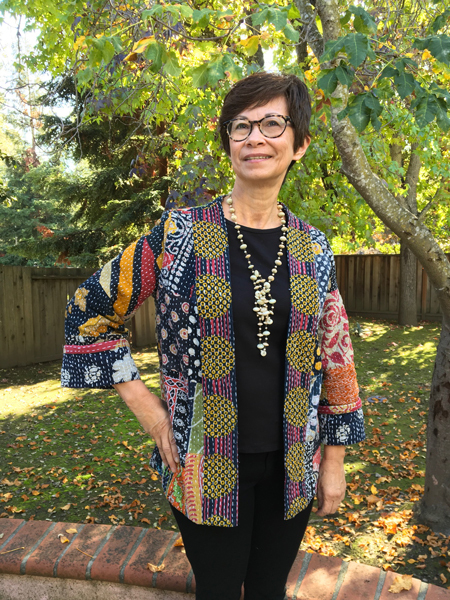 Jeanne O used Simplicity 1540 pattern. 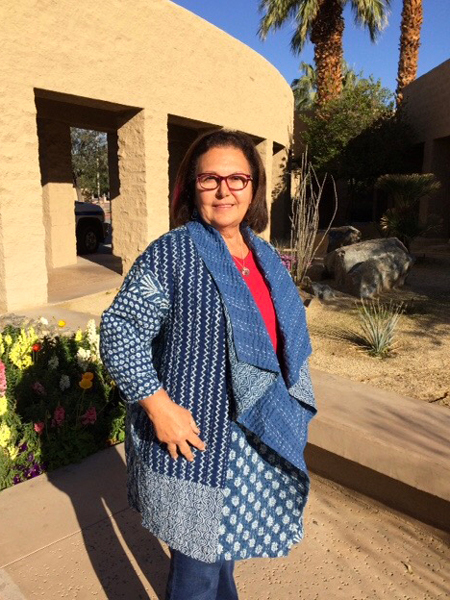 Patty chose the StyleArc Mason Knit Jacket for this reversible garment. 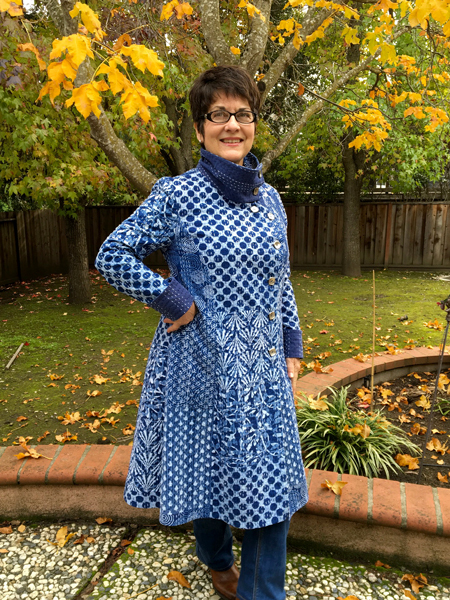 Patty S chose Katherine Tilton's Butterick pattern B6254 for her coat. 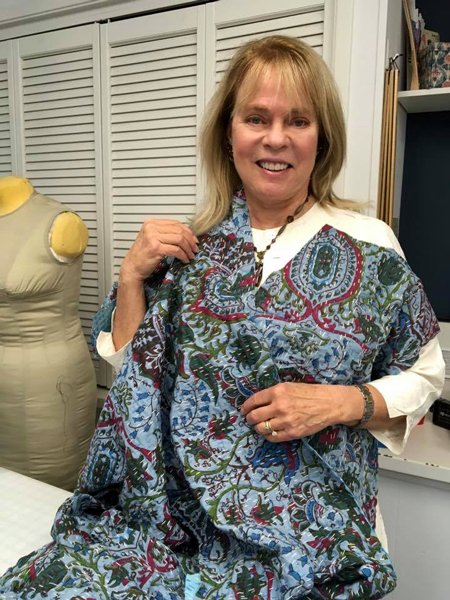 Barbara S finds vintage patterns on the internet. 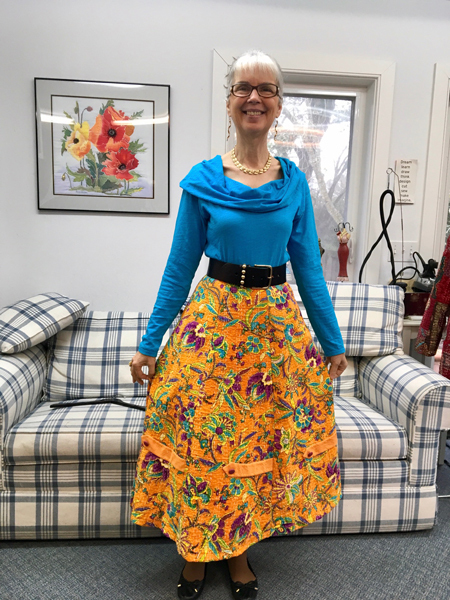 This skirt was made using a Kantha quilt and a 1956 Simplicity pattern 1691 which originally cost $0.35. 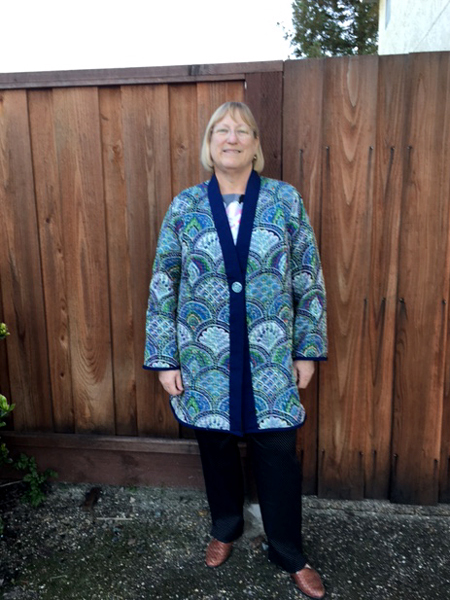 Santina H made her reversible Kantha coat using Butterick B6292. 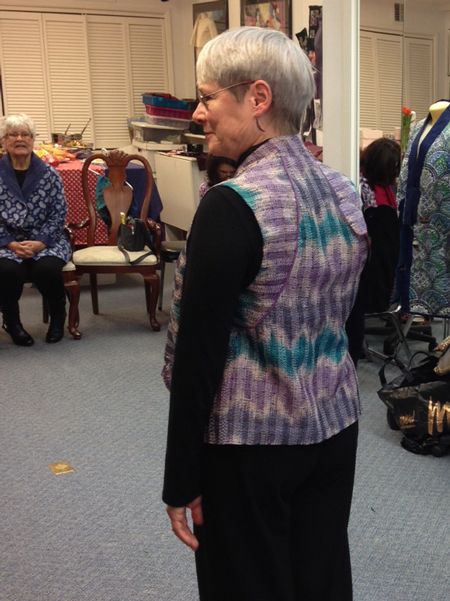 Santina H models her vest made with the StyleArc Veronica vest pattern. 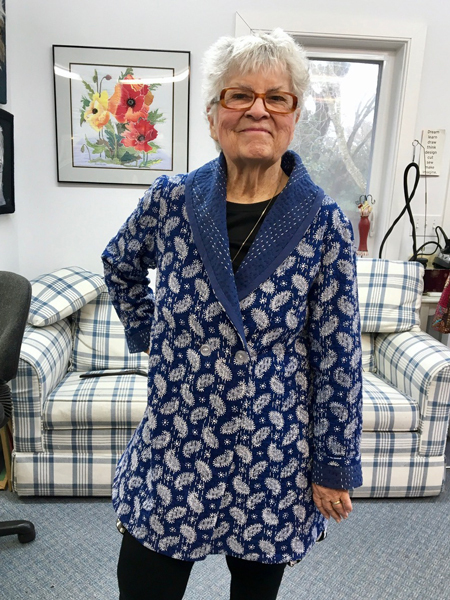 Sylvia used Butterick B6251 for her reversible coat. 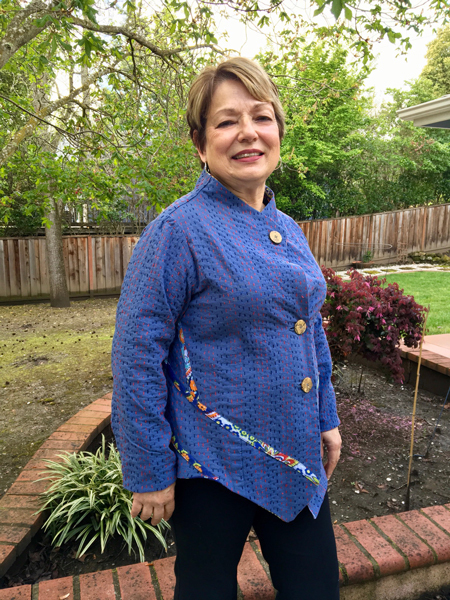 Liddy C made her own pattern for this jacket made from a bright colored Kantha quilt. 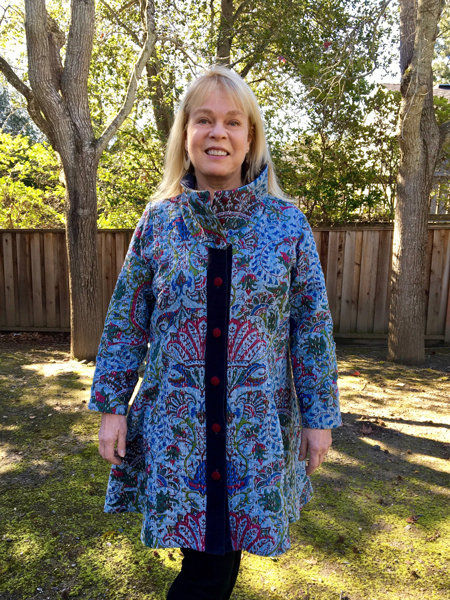 Dell W chose Butterick B6370 for her coat. 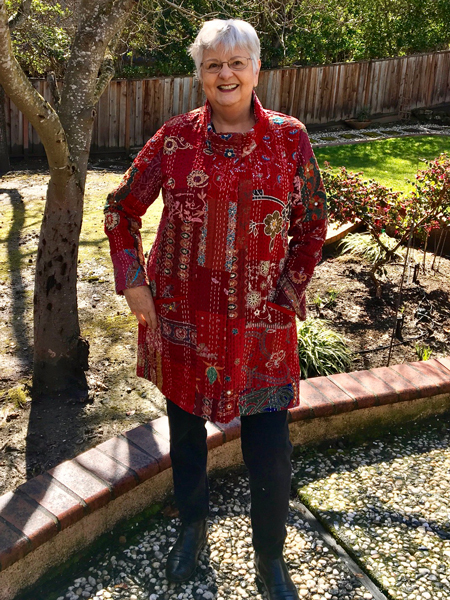 Ellen S found the perfect red buttons for her Kantha coat. 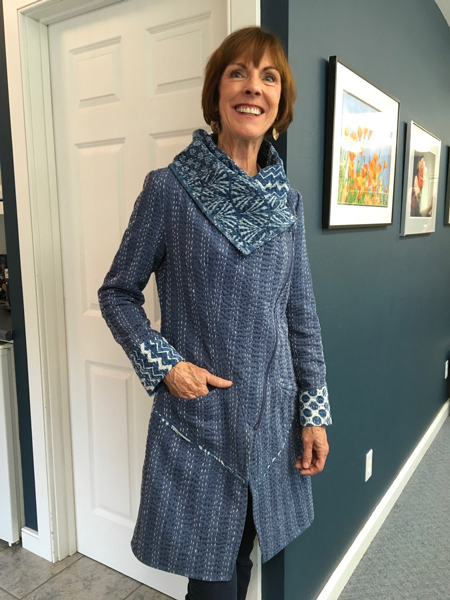 She used the Sandra Betzina Vogue pattern V1494. 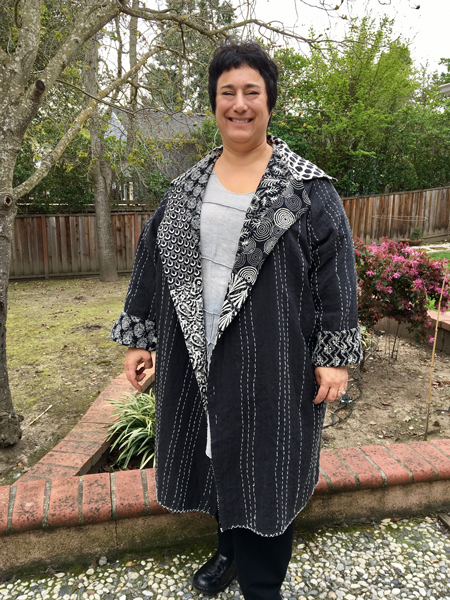 JoAnn F used Tabula Rasa jacket pattern by Fit for Art for this garment. 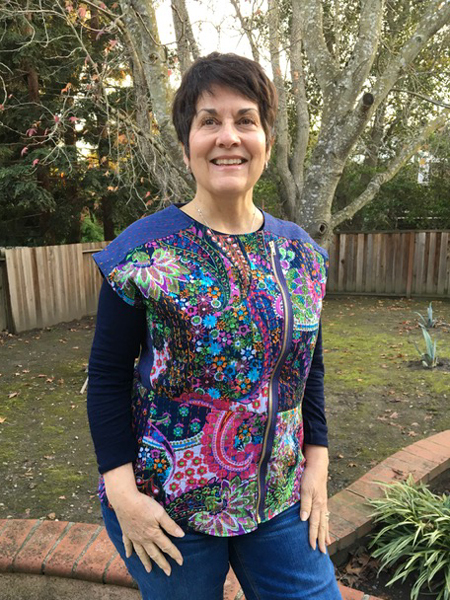 Susie B created her garment using Vogue pattern V8841. 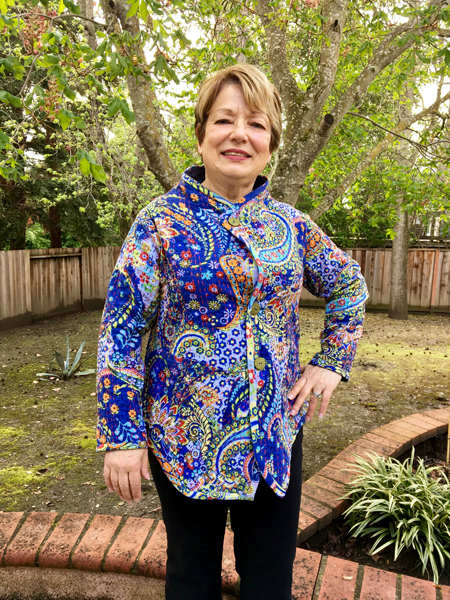 Virginia chose Katherine Tilton's Butterick B6106 funnel collar pattern for her reversible jacket. 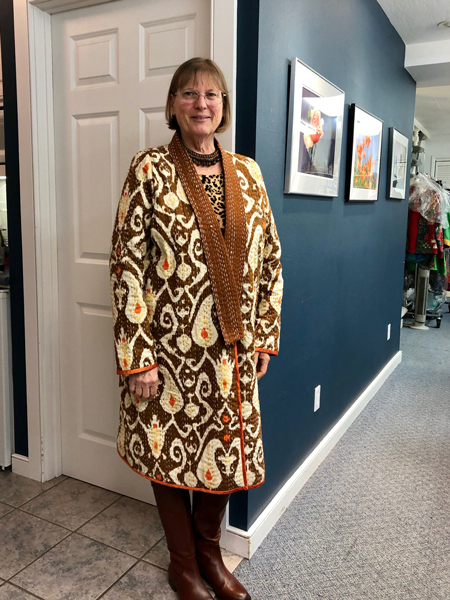 Lark S modified a Sandra Betzina pattern Vogue 1318. 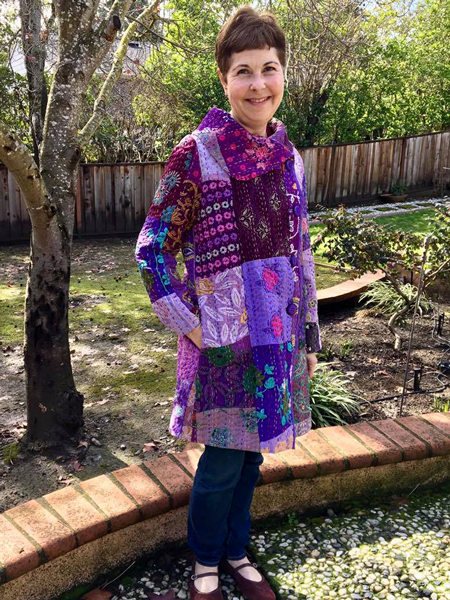 Vicki E transformed this quilt into a beautiful coat. 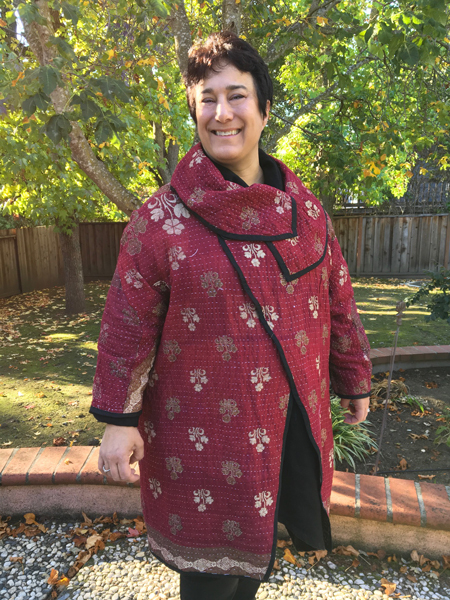 Red trim really makes Vicki's coat look special. 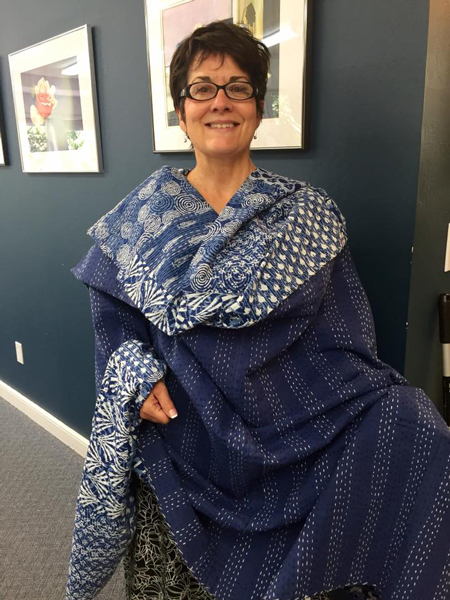 JoAnn’s beautiful kantha is made up of silk squares. 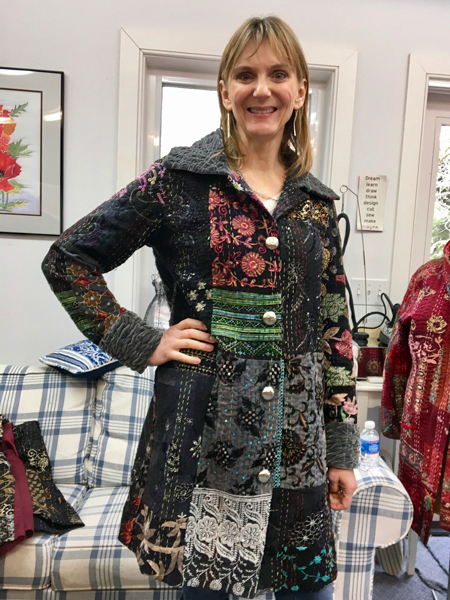 Lisa C is one of Jane's newer students, and loves her new coat. 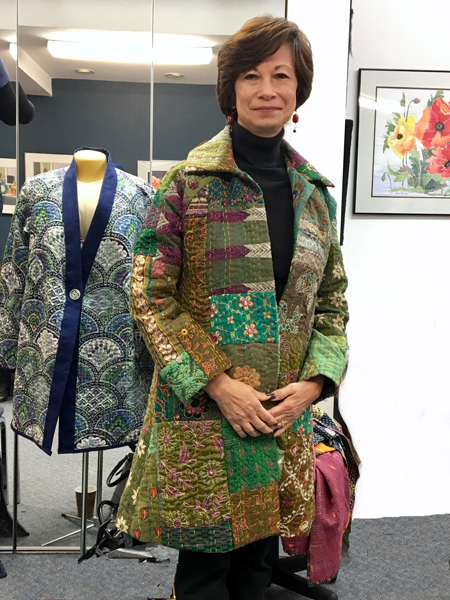 Diana just finished her coat made with a Kantha quilt and a Loes Hinse pattern. . 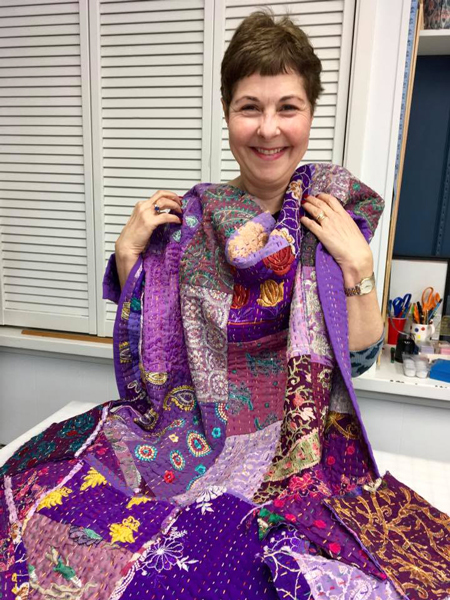 It looks so good on her, and she loves it. 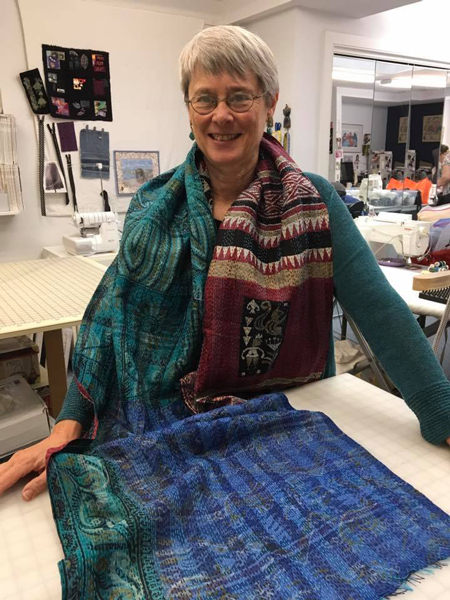 She bound all the edges and inside seams with silk dupioni. 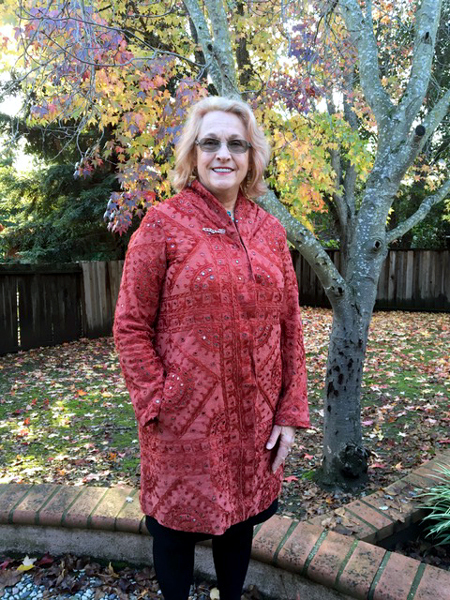 Jane Foster used a red Kantha quilt and Marcy Tilton Vogue V8676 pattern for her coat. 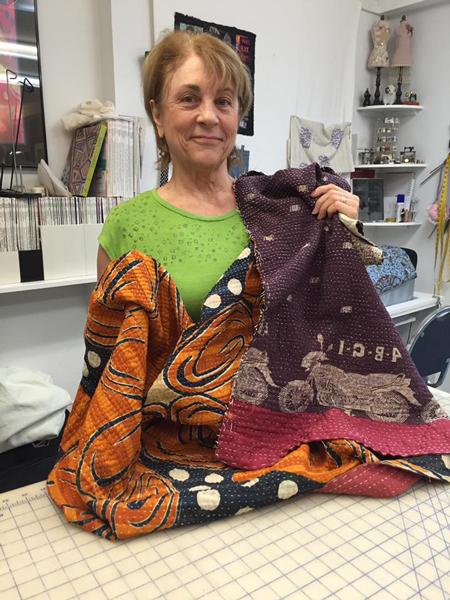 She lengthened the pattern.